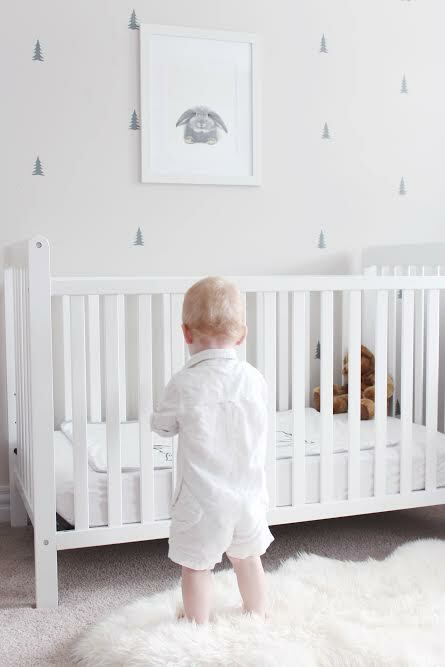 I'm so excited to be sharing my littlest boys nursery with you all today. This room has been such a fun space for me to decorate because I feel like it is just so 'him'. We love animals in our house and the boys really enjoy looking at pictures of them so I adore all the prints on his walls that he can stare up at. I have always felt like kids rooms need to be a balance between fun and playful, yet still calming and cozy. After all we want them to be able to wind down and relax in there, but also let their imaginations run free. I tried keeping things in neutral tones to help keep his room from being too crazy stimulating, yet I feel there is lots in there for him to look at. 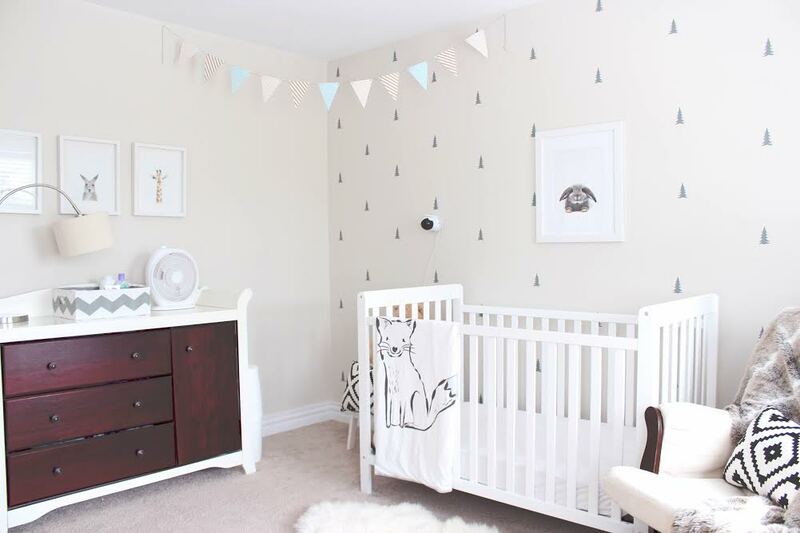 One of my favourite things in his room is the little tree wall decals. 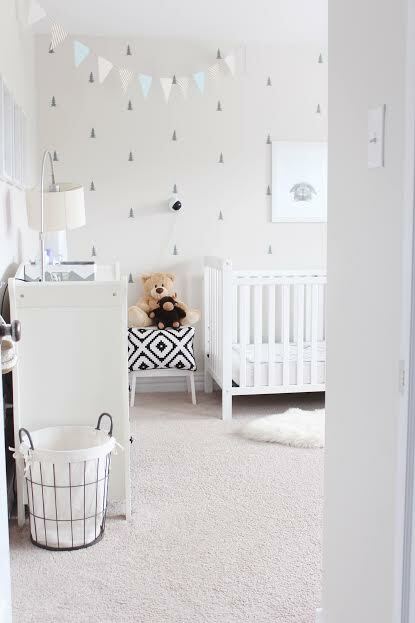 You guys know I love decals for kids room because they are inexpensive and high impact, which is the best combination! Plus they just add to the little woodsy animal theme. I absolutely love that fox blanket on his crib and it is the perfect weight for naps and snuggles. The dresser also functioned as a changer when he was a baby and was his older brothers. I painted it two-toned here and I also had switched out the knobs on it. It provides a good amount of storage but I am thankful that he also has a really large closet as well. We also store all of his big toys and play bins in his closet so that they are tucked neatly out of sight when not in use and help keep his room from looking to cluttered. I talk about the boys reading nooks here and I love having books out that are super accessible to him. The shelves don't hold all of them but we are able to switch books out every now and then to keep him engaged and seeing new ones to look at. I also adore that dear print hanging on top of the book ledges, I got it from Target (tear) before they left and I feel like it goes perfect there. 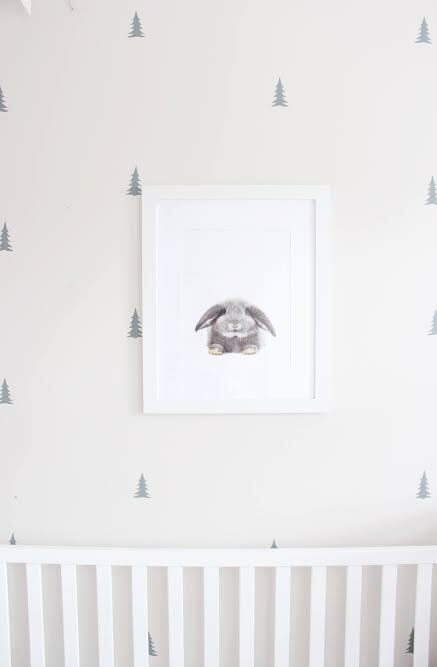 And oh my gosh, can we just talk about this bunny print?! Like how stinkin cute is that. As soon as I saw it I knew it would be perfect for over his crib. 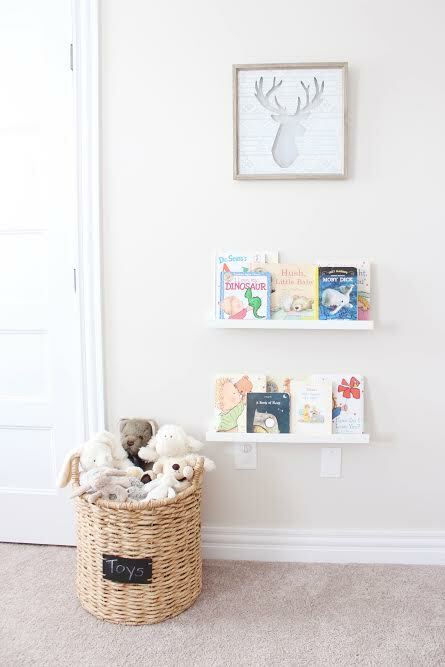 Also on the topic of pictures over cribs, I always opt for light weighted, plastic not glass frames because they are easier to hang and I just feel better about having something that isn't glass over his bed- Michael's has some great options. The rocker that I have is the same one I had for my first son and has seen a lot of rocking and nursing nights. In hindsight I would have gotten something a little more roomy and comfortable but that over 4 years ago and I didn't really know what would be best. So that is my one piece of advice to all you pregnant mommas out there, spend the money and get the luxe glider, it's totally worth it and you spend a many days and nights with babe sitting in it. 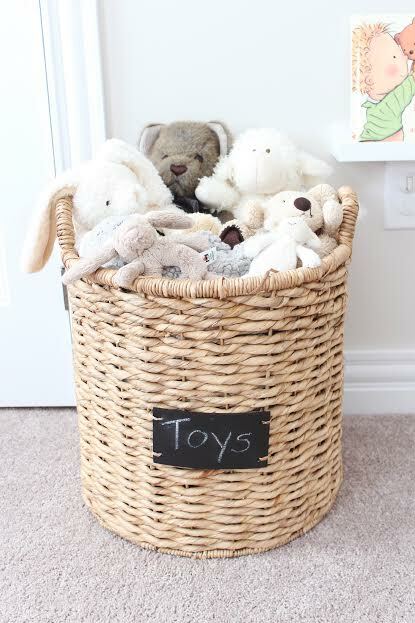 I love finding cute ways to store my little guys toys and baskets are just the perfect alternative. This one is from Target but Homesense has lots of great options! 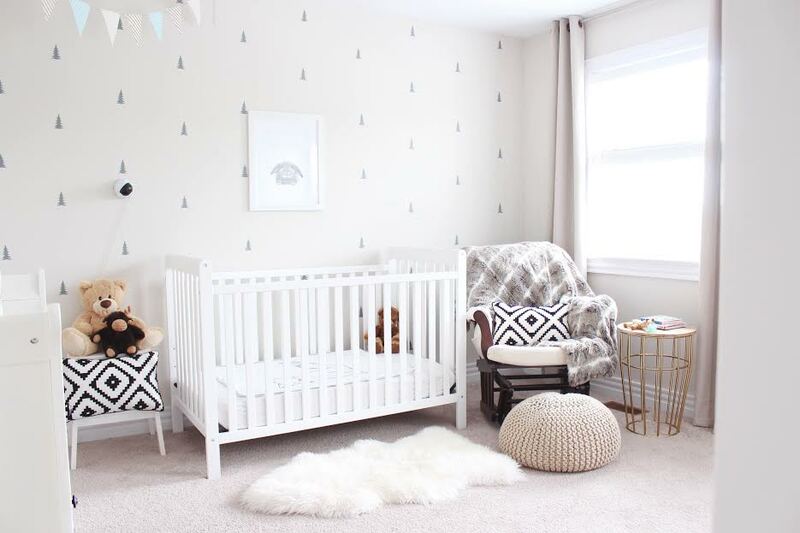 I hope you all enjoyed this little nursery reveal, to say my little guy loves his room would be an understatement. I love watching him play and discover new things and it makes me so happy that he has a room that is a reflection of the sweet, loving little boy that he is.